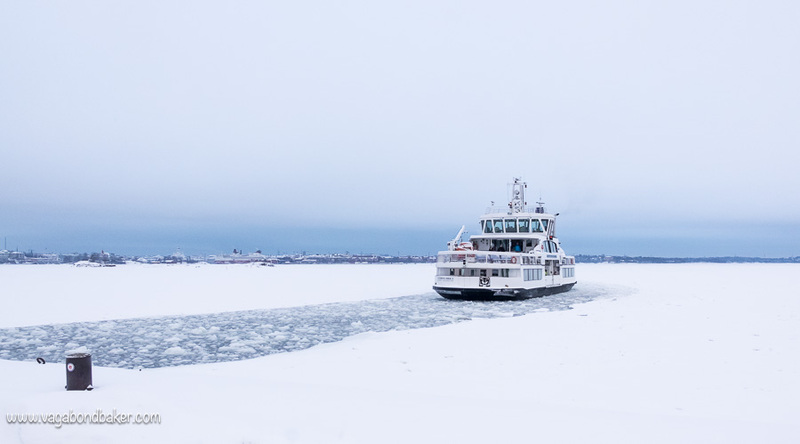 The little ferry made its way along the narrow blue ribbon of sea cut through the ice, the broken chunks of which knocked against the hull turning this simple commute from Helsinki to Suomenlinna feel more like an adventure than a short harbour crossing! Either side of the boat the undisturbed snow-topped ice spread to the shore. 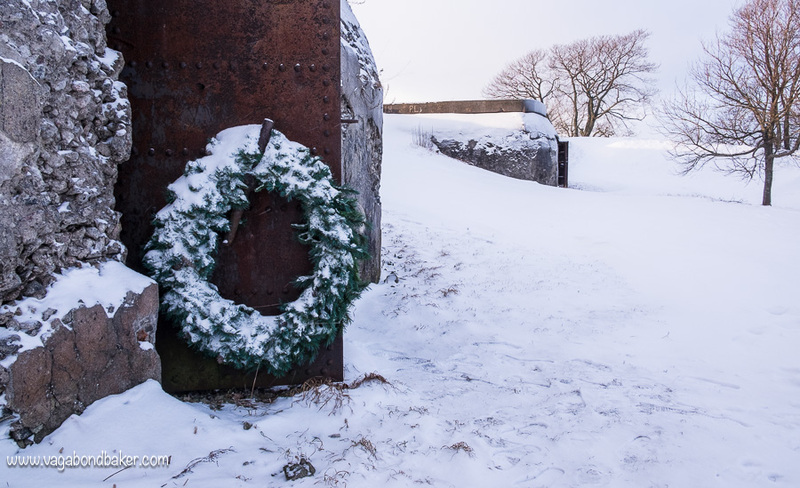 I had visited Suomenlinna back in December 2014 and it had been one of the highlights of my trip to Finland. It had been a sunny winter day, the low sun painting the islands with rich golden hues and I’d mused on how it would look blanketed in snow. 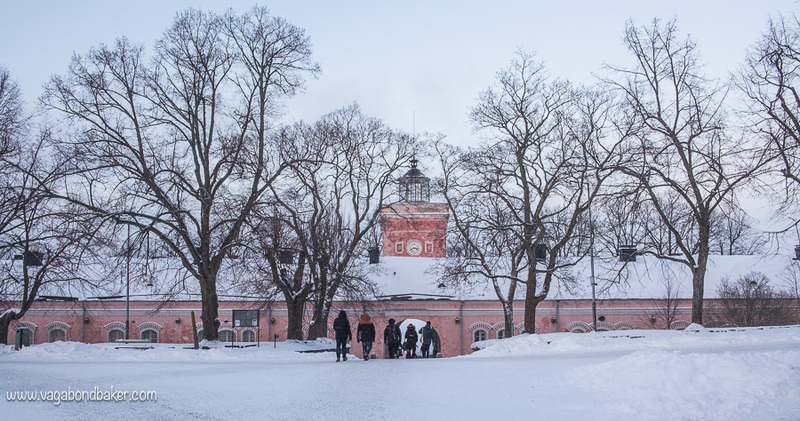 Stepping off the ferry I needed to imagine no longer, the scene before me was transformed: Suomenlinna was now a wintry land of whites and blues, with punctuations of colour from the pastel painted buildings. Suomenlinna is a military fortification dating back to the 18th Century, constructed over six islands in Helsinki’s harbour. 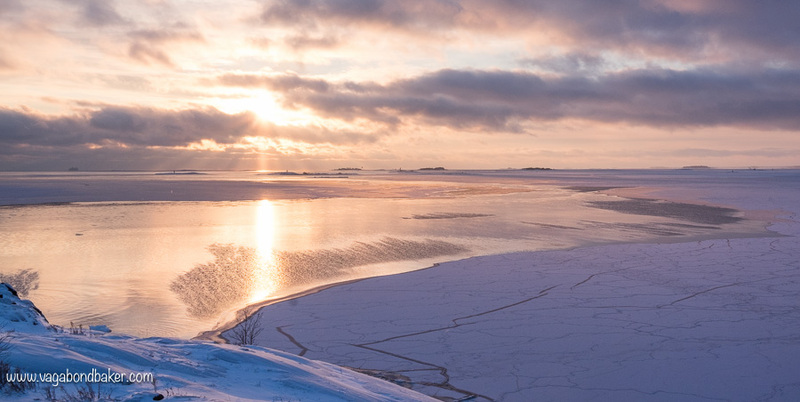 The islands have been designated a UNESCO World Heritage Site and they are free to explore, making them a fantastic day out from Helsinki at any time of year. 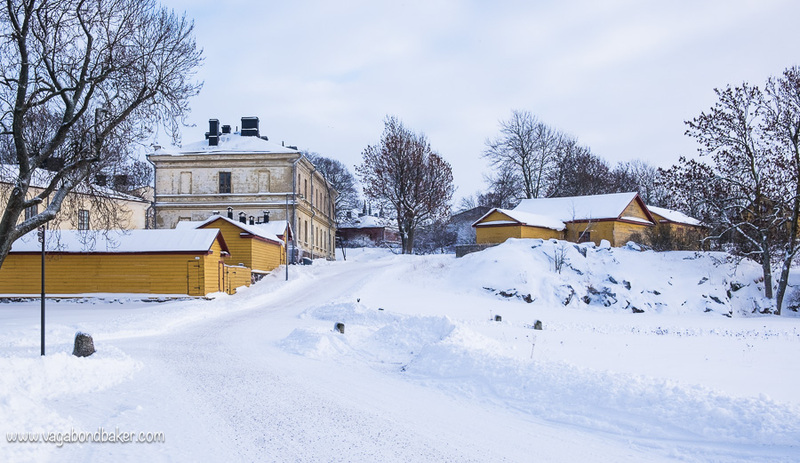 The snow was pretty deep but the main footpaths and cobbled roads had been cleared making Suomenlinna easy to explore even in these more challenging conditions. 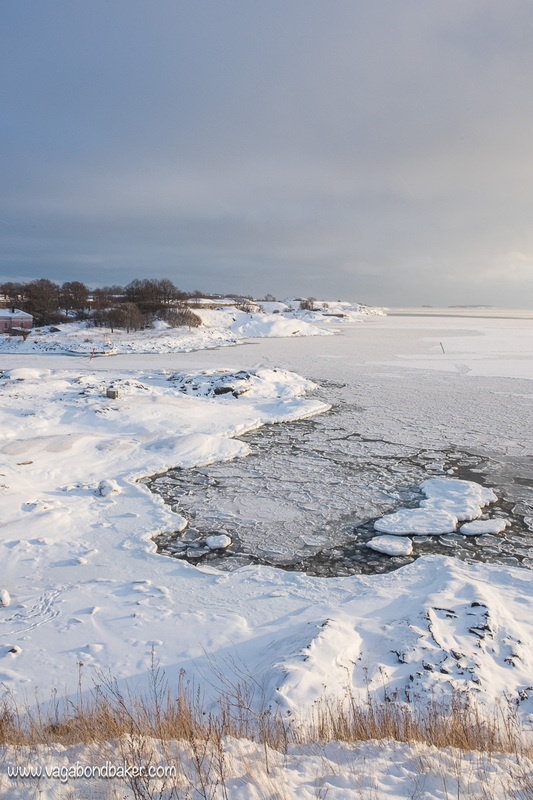 The islands are inhabited and on this sunny Sunday a game of ice hockey was being played on Iso Mustasaari, while throughout the islands children were tobogganing wherever there were slopes. The good weather had brought many people over for the day from the city. 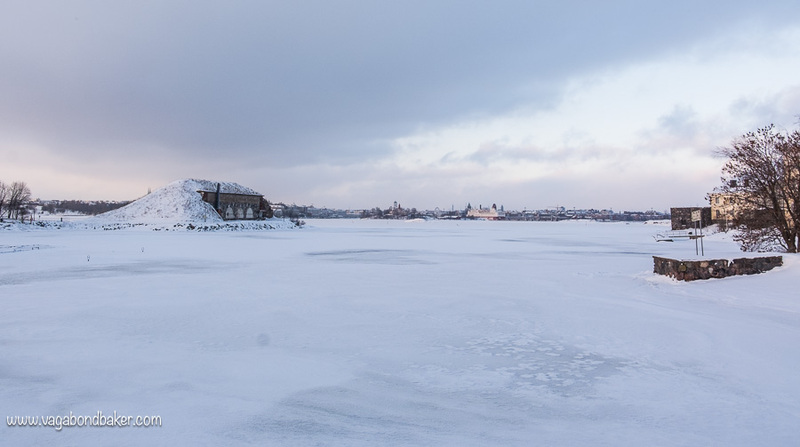 I’d decided to spend more than just a day trip on Suomenlinna though, booking myself into the Hostel Suomenlinna, meaning that I could explore at a more leisurely pace and have somewhere to retreat to when I got too cold. 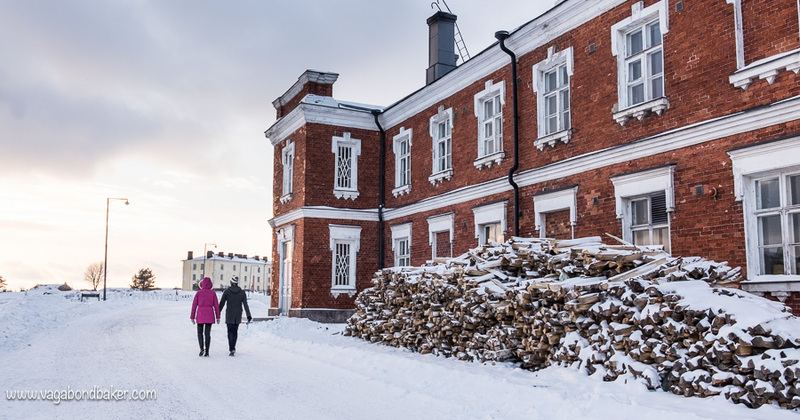 Hostel Suomenlinna is situated in a beautiful former school, it has both private rooms and dorms. I really enjoyed my stay here: it has a communal kitchen (there is a great supermarket very nearby), wifi and it’s open year round. 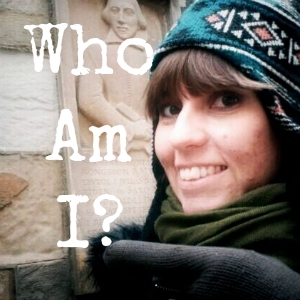 Wrapped in as many clothes as I could fit under my coat I set off to explore the islands. 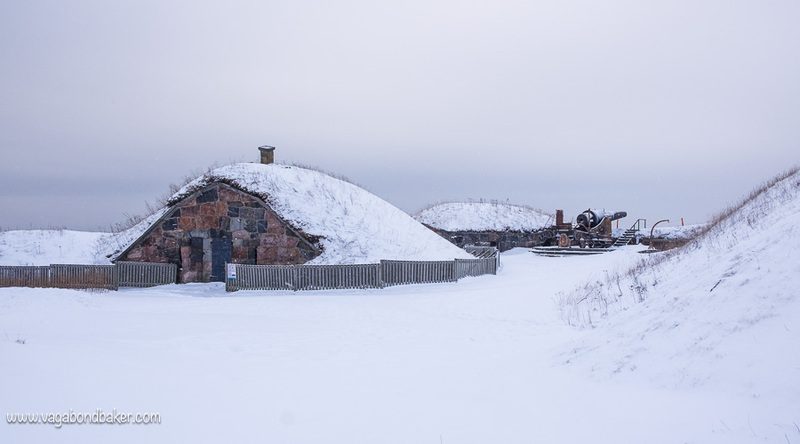 I went first to the two small islands on the west side of Suomenlinna: Pikku-Musta and Länsi-Musta. I hadn’t visited these islands on my first trip. 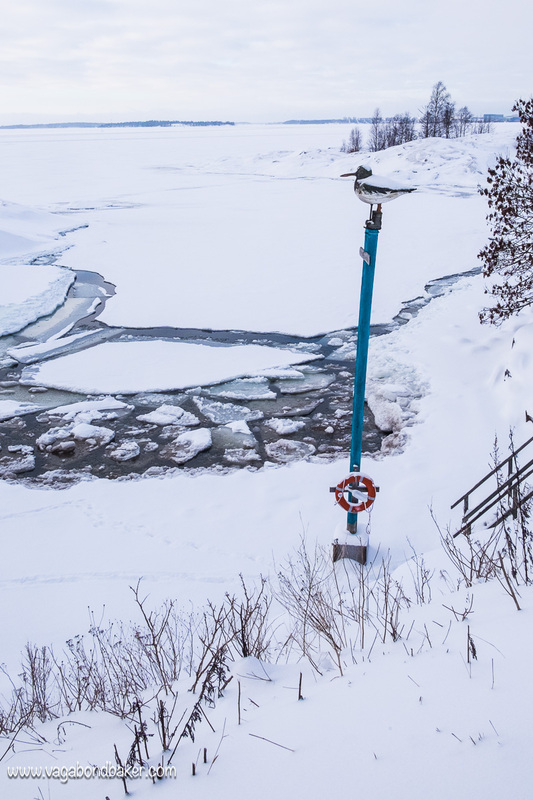 They are linked together by bridges, which now spanned the frozen sea channels. The day trippers had mostly stayed on the two main islands, I stood overlooking the Baltic Sea in peaceful solitude. Walking south down Iso Mustasaari I found myself retracing my steps from a year ago, finding familiar scenes around every turn. 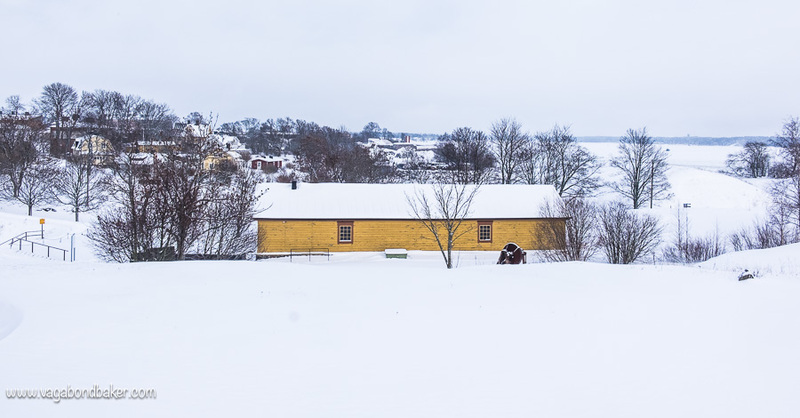 Remembering the bicycle that was propped up against the wall – now long gone; remembering the spot where I sat and ate a korvapuusti with frozen fingers. 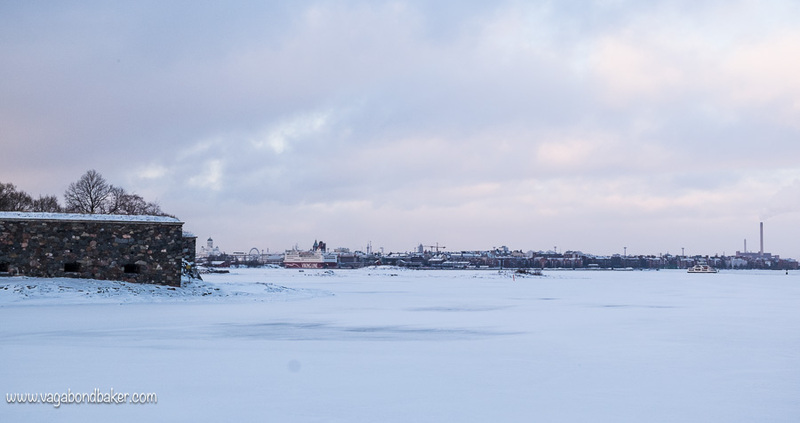 Standing on the fortifications of Kustaanmiekka at the southern end of Suomenlinna I acutely remembered the feelings of joy and sadness that had coursed through me on this very spot thirteen months previous. How different that view now looked, a monochrome view back across the islands to the city. The view across the sea to the south however was stunning. 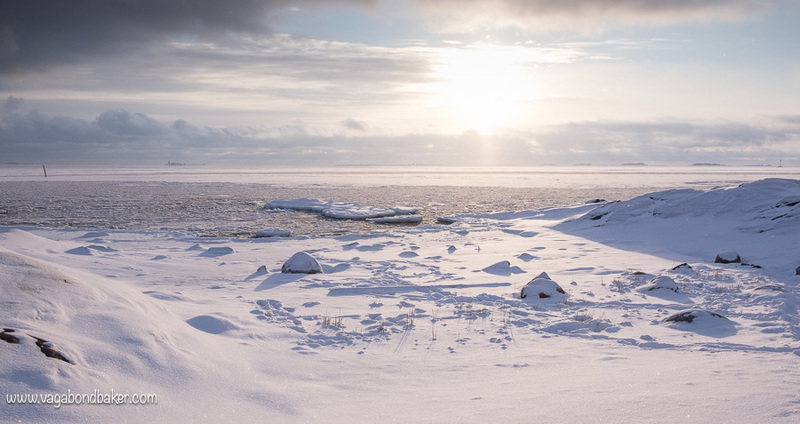 The afternoon sun split the winter clouds that were rolling in, flooding warm light over the partially frozen sea. 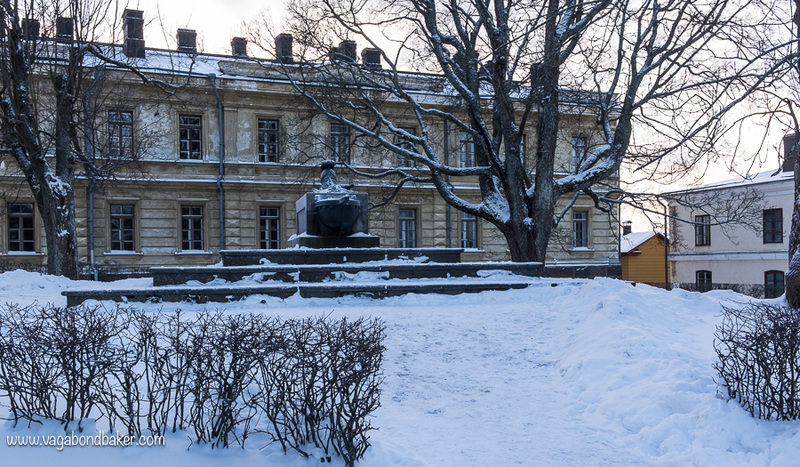 The snow began to fall softly as I wandered back towards the hostel, settling lightly on my shoulders and scarf. So dry and delicate, it brushed off effortlessly. 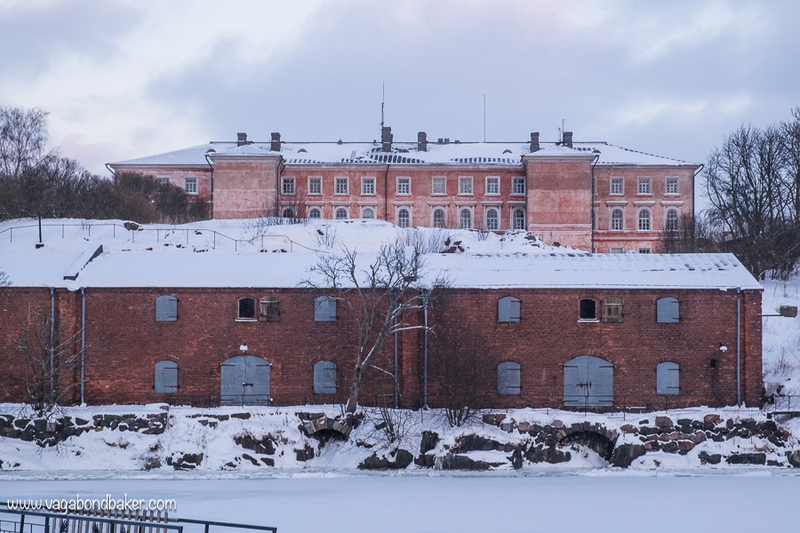 The following morning was bright and cold, I decided to hunt out more parts of Suomenlinna that I hadn’t seen on my previous trip. 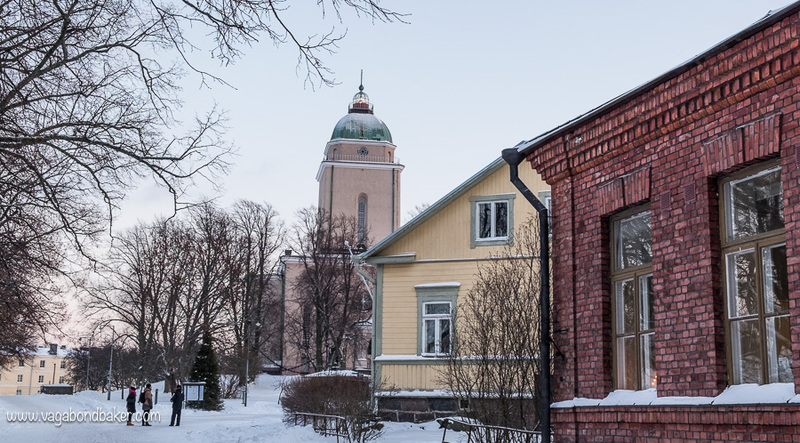 One of these places was the Submarine Vesikko, a picture of which was hung in the room I’d been staying in. 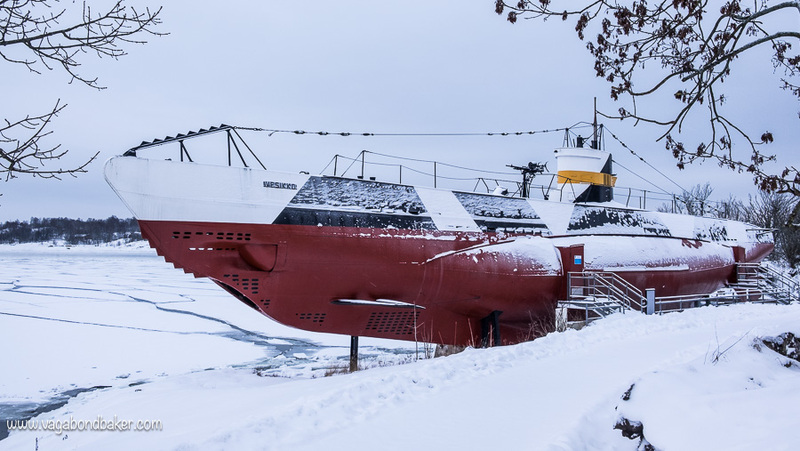 The red body of this decommissioned Finnish submarine was the only shot of colour in the wintry scene in front of me as I rounded the corner along a path of untrodden snow. I was curious that I hadn’t spotted this a year ago, it’s rather hard to miss! 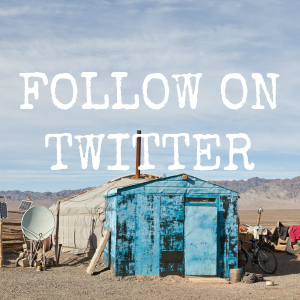 The submarine, dating from the 1930’s, is open to visitors during the summer months. 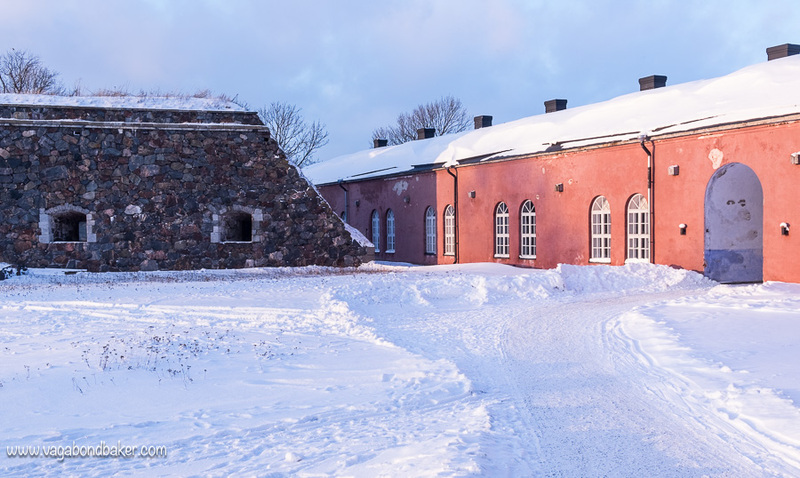 The Suomenlinna Museum is the only museum on the islands that is open throughout the winter. It shows the story of the fortress through it’s history and includes a short film. There is also a little cafe there which makes the perfect stop for a coffee. I went in there for coffee and came out with armfuls of souvenirs from the gift shop – quite literally, two gorgeous prints rolled up into long cardboard tubes! 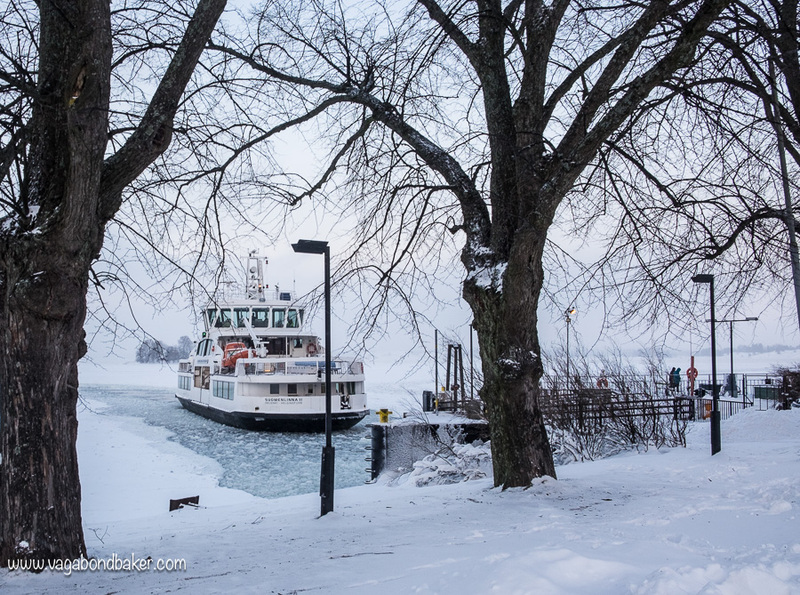 I enjoyed my two days on Suomenlinna so much I returned a week later for two more nights. 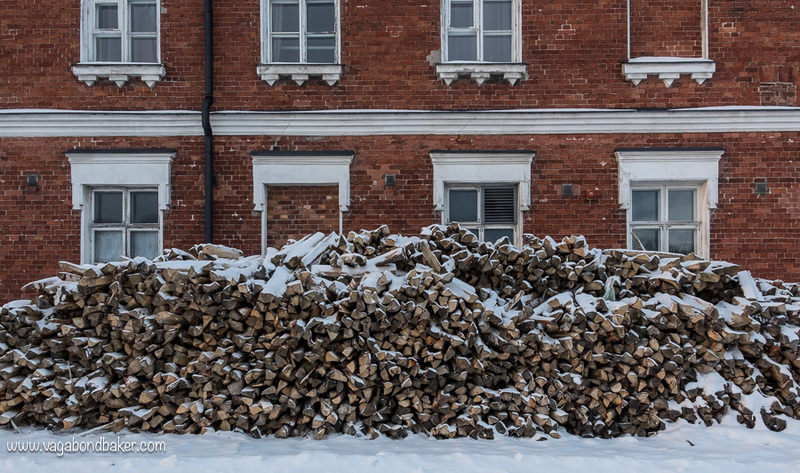 I like the peace and stillness of winter here, away from the city. I love the way the snow silences everything, a muted world with the occasional twitter of little birds flitting from tree to tree. 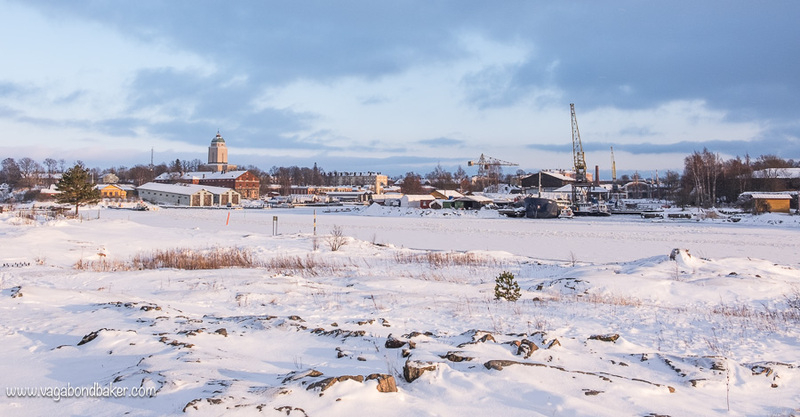 Suomenlinna can be reached by frequent ferries from Helsinki Kauppatori (Market Square). The journey takes around 15 minutes. You can buy tickets from the machine at the ferry terminal. 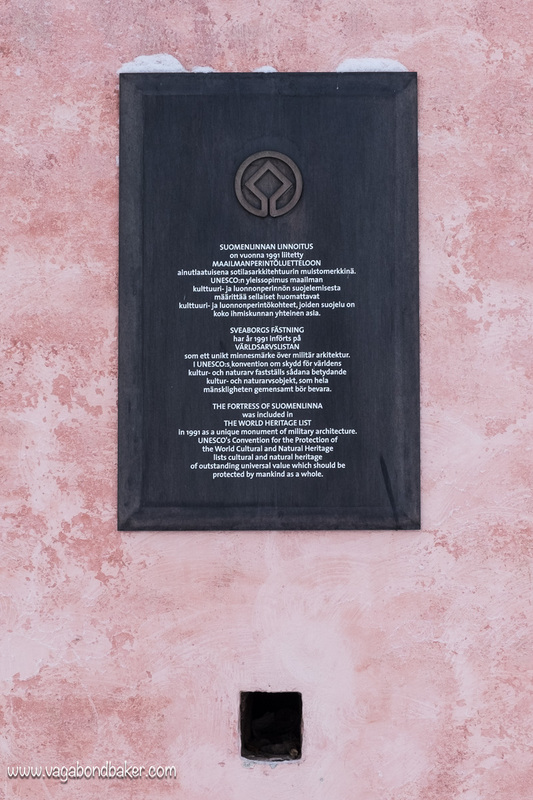 A 12 hour ticket for Suomenlinna is available for 5€ (2016) in the single ticket section of the menus on the machine, perfect if you are visiting on a day trip. If you have a HSL transport day ticket you can use that for the ferry too. 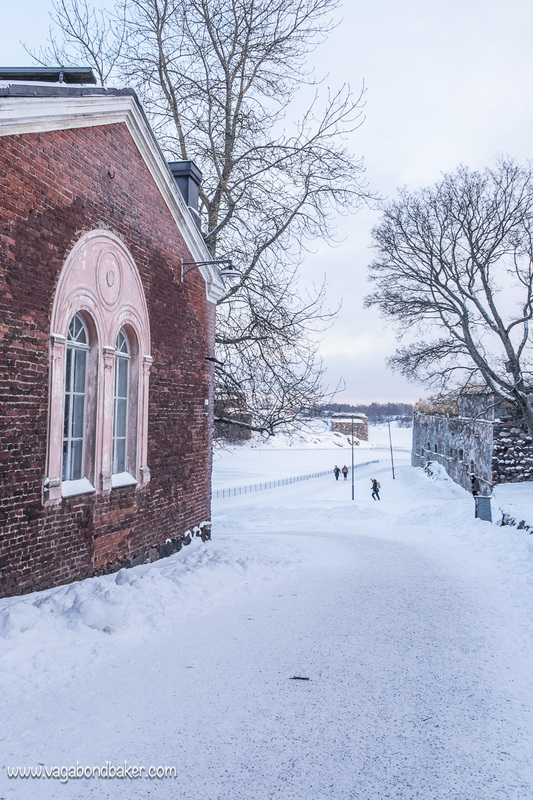 Suomenlinna is open all year round and is free to visit. 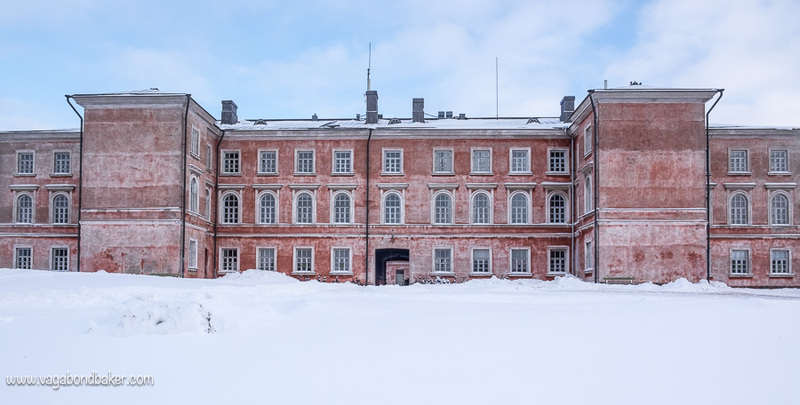 Some of the restaurants and museums are not open during the winter. 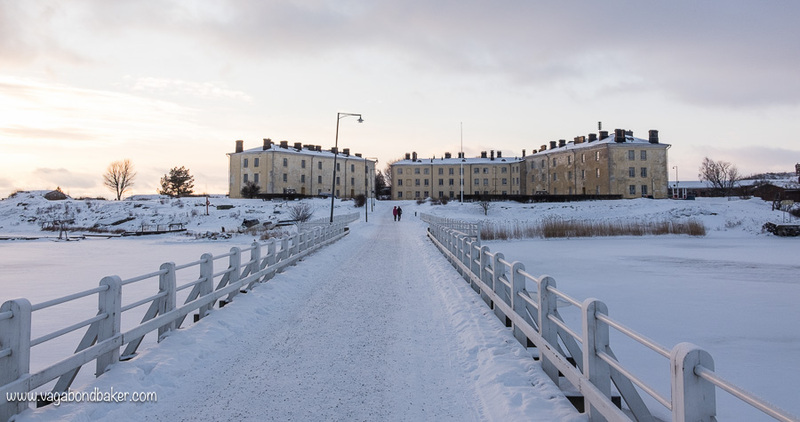 You can book Suomenlinna hostel on their website here. 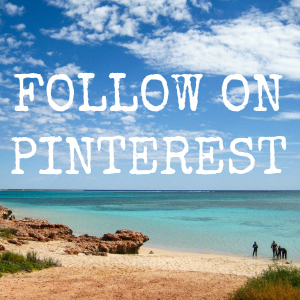 Pin this post for winter inspiration! 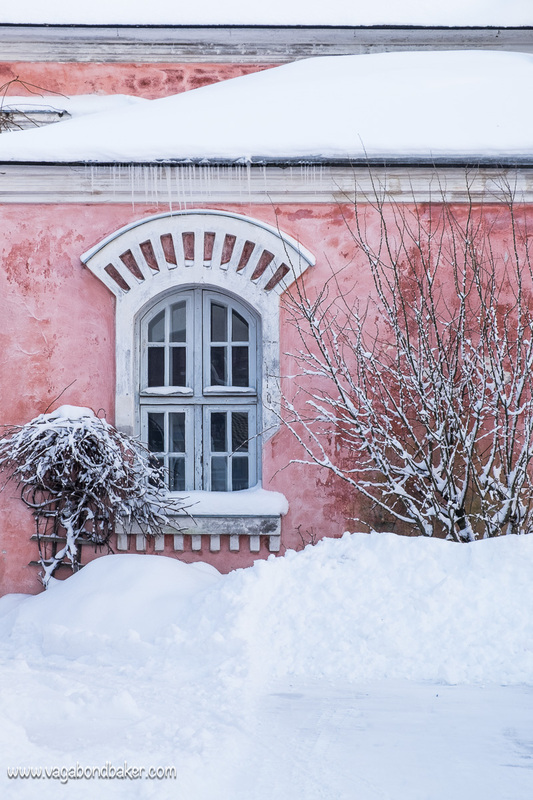 Have you ever returned to a heartfelt place and seen it covered in beautiful snow? The photographs look marvellous. Just so lovely and snowy! 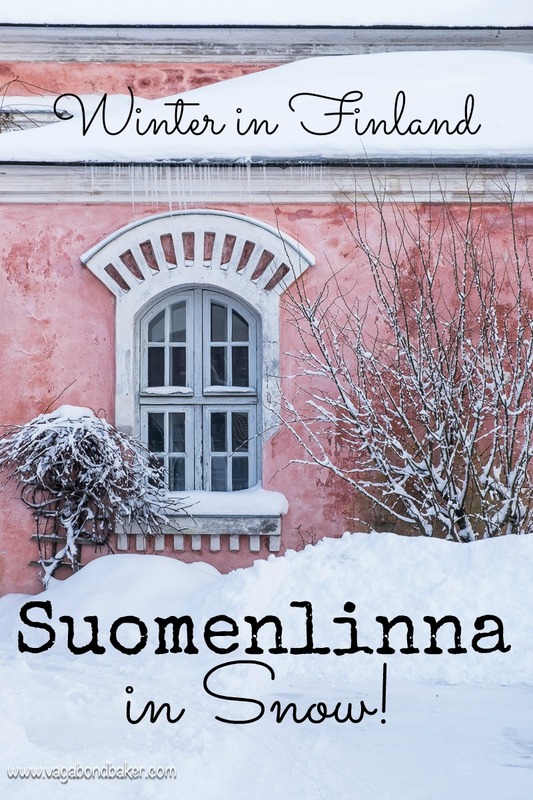 We went to Helsinki last year but we were only there for three days as it was really a trip to the Baltics ,and as Finland was so near, I just happened to add it on at the last minute lol! ‘Can’t wait to visit again. Thanks Victoria! Oft, that’s a quick trip! I can’t even tear myself away! Hahaha! 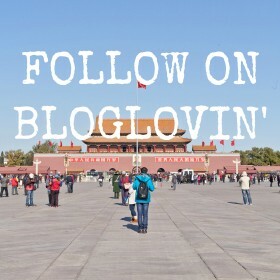 Do come again! Thank you so much Louise! It really is so magical, I just want to keep sailing over there! I’ll be back in Settle for a few days in a week’s time! Incredible photos, Rachel. 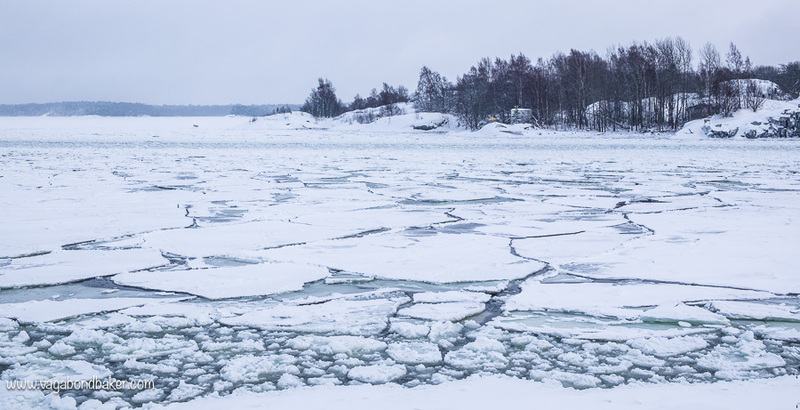 I can see why you love Finland so much – it’s a winter paradise. It really is gorgeous! The snow has mostly melted now though here in the south. This place looks gorgeous. I imagine the peace and serenity of the winter days is refreshing. 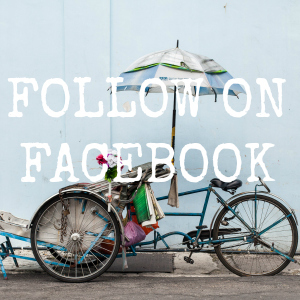 Thanks Tricia! 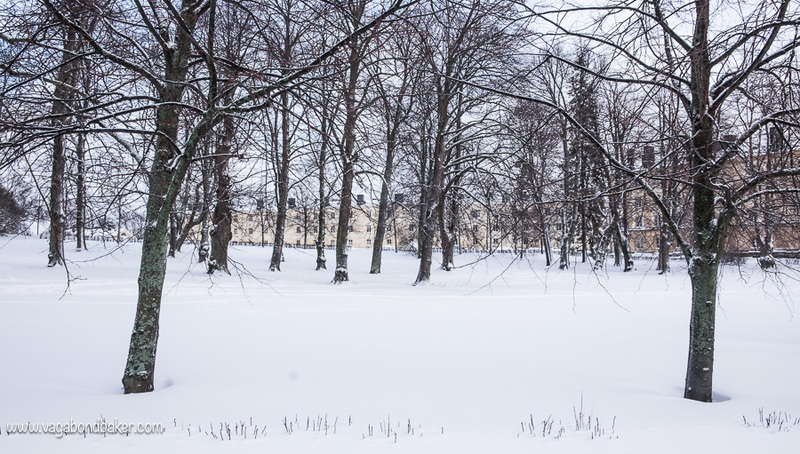 It really is so serene and beautiful in the winter! How gorgeous! 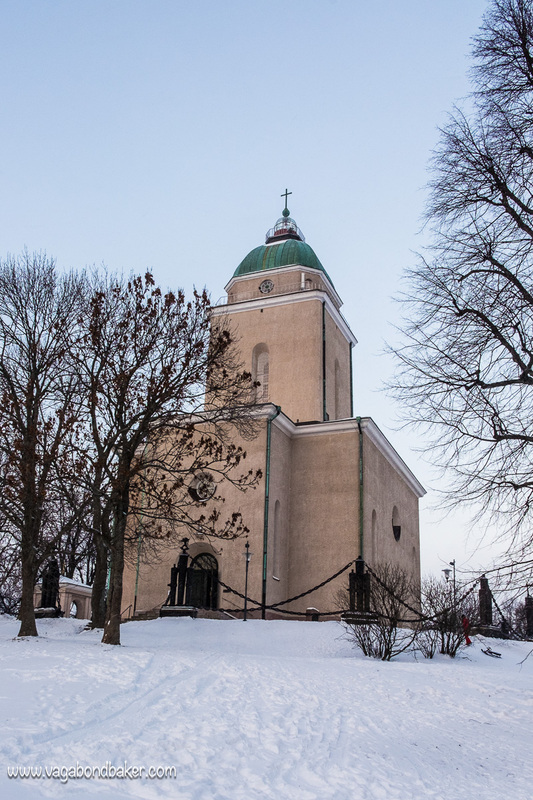 I’m quite a convert to the Northern Europe winter city breaks now after Tallinn, I’m going to have to try Finland next year. Me too Lucy! I’m totally in love with this winter, definitely worth escaping a wet British one for! Tallinn looks so pretty, I haven’t managed to tear myself away from Helsinki yet!